A few weeks ago, my neighbour and I did a swap of our garden goodies - I gave her pears and she gave me a bag of large cob nuts. I spent an enjoyable afternoon in the late summer sunshine cracking the nuts, before roasting them in a medium oven until they were golden. Using one of my favourite Martha recipes, I dunked the nuts in caramel before dusting with a salty, sugary, spicy coating. DELICIOUS! The recipe can be used for most nuts, and I particularly like using pecans and almonds - do roast your nuts first though, it definitely improves the flavour. 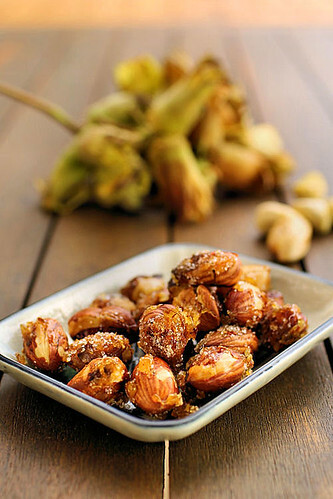 These nuts are great to serve with drinks, and they make a perfect Christmas nibble. Adapted from an old Martha Stewart recipe that I printed out years ago, but the original is no longer on her website. 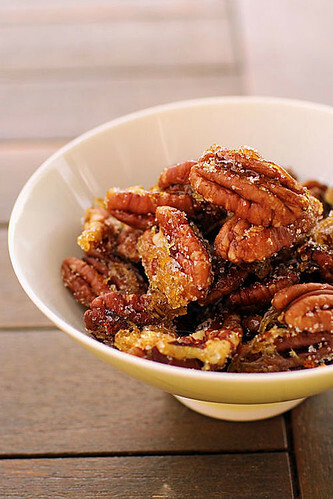 Heat the oil in a frying pan and add the pecans (or nuts of your choice). Sprinkle the 1/2 cup of caster sugar over the nuts and stir until the nuts are golden brown and the sugar has caramelised. Remove the pan from the heat and pour the nuts into a medium mixing bowl. Sprinkle the granulated sugar, salt, ground cumin and red pepper flakes over the nuts and stir well, separating the nuts with the spoon. Allow the nuts to cool before serving. The spicy nuts can be stored for a couple of weeks in an airtight container. My local polish supermarket is selling cobnuts at the moment so I've just discovered them. They are fantastic aren't they? 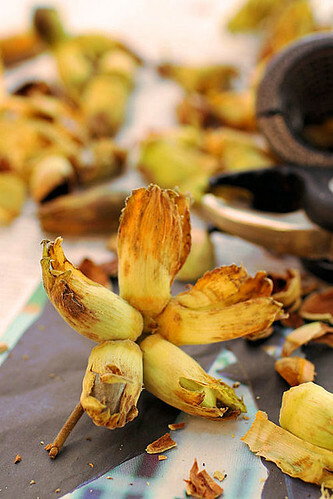 They have that lovely sweet but tender texture and flavour that is much more delicate than hazelnuts. this is one of my favorite snacks in the world! Spiced nuts just scream CHRISTMAS to me. I adore them and they make super gifts too don't they? Hope all's well with you.